Cost reduction of maintenance work activities could be achieved not only by decrease of the work scope but also by the optimization of the technical performance. Linear Assets Maintenance solution from Skybuffer allows for maintenance work to be done faster, cheaper and with better quality. Maintenance work for several linear sections of gas pipeline is performed by one technician or a maintenance crew that is driving the truck from one section to another. Spare parts and tools are taken by the technician at the beginning of the shift and stored in the truck boot. SAP HANA Platform based custom solution should help the technician to find out the best route taking into consideration the spare parts and tools that are in the truck and the maintenance work that is scheduled for the date. A map-based web application could be executed on the technician’s mobile device (for instance, tablet), it displays information filtered by the truck number that is used by him or the maintenance crew. On the login screen the truck number should be entered. It is not necessary to use the number plate and a special numbering system could be developed to assign the technician to the truck stock. On the main screen of the application it is possible to see the current location of the truck and the work that is scheduled for the technician. The truck information can be displayed by a simple click on the truck image. The application allows to drill-down to SAP GUI in order to observe and process the Maintenance Order directly in SAP ERP System if it is convenient to the user. The maintenance order consists of Tabs, reflecting the entire information about the maintenance work to be performed for the current function location that is defined as master data in SAP ERP system for the certain pipeline linear section. SAP HANA Java Connector is used to read work order data in the real time that ensures data consistency in SAP HANA Platform application and in SAP ERP system. Thus switching to Operations tab, a user can see the same operations, that are shown in custom Linear Assets Maintenance Application empowered by SAPUI5 Framework widgets. Components data represented on the subsequent Tab is also the same as a user can see it in custom application. Data simplification approach that was used during design phase of SAPUI5 application allows getting advantages by a technician focusing only on the information that is relevant for the maintenance process. Location Tab shows information about the exact location of the gas pipeline defect to be fixed. Special attention in this Tab should be paid to the Linear Data area. The location marker is predefined. According to the solution design concept, there are geo coordinates captured as marker offsets values. This approach allows making precise localization of the maintenance work to be performed to the pipeline section. Fig. 13. 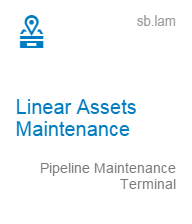 Linear Assets Maintenance :: Maintenance Order in SAP GUI :: Linear Data. The technician can confirm the operations that have been executed and the spare parts that have been consumed. Depending on the requirements it is possible to adjust either the spare parts list, or the spare parts amounts, or the operations performed, or the number of hours spent on maintenance activities execution. System has calculated the optimal route to the next point of maintenance. The work order that is highlighted with red color is excluded from the route. Operations for that work order cannot be “Confirmed”, either.